I always look forward to the return of spring when the color returns to the rolling hills in California. Brown for much of the year, they burst into a rainbow of colors lasting from February to June, depending on the elevation. That’s one of the unique things about the wildflower bloom in California. With it’s rich topographic diversity, if you miss the bloom in one location you can almost always find another opportunity elsewhere. I took this image, during the last workshop, on a hillside in the Merced River Canyon. 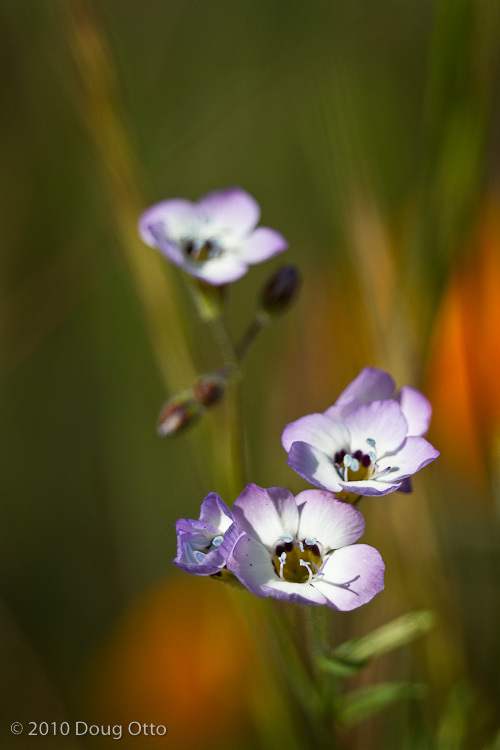 These little gilia flowers were intermixed with a field of poppies. To create the photograph I used my Canon 100-400 lens. Normally, this lens has a minimum focusing distance of about 6 feet. To shorten that distance, and improve magnification, I added 68mm worth of extension tubes between the lens and camera. The result was a very sharp foreground flower with all of the foliage in the background just blurring to color. Dramatically shortening focusing distance, tubes are a great way to shoot macro images in the field without having to haul around a dedicated lens. Since they contain no optics, they’re very lightweight and inexpensive. This entry was posted in Photography and tagged Bird's Eye, doug otto, Gilia tricolor, Merced River Canyon, Photography, Spring, wildflower. Bookmark the permalink.